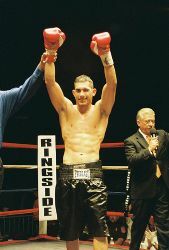 Cestus Fighter, Ray “LINO” Gatica Ready To Win big In Las Vegas on February 13! February 13, 2010, the Las Vegas Hilton will be the site of a great night of boxing as Top Rank, Inc.promotes a great Pay Per View fight card featuring “The Filipino Flash” Nonito Donaire defending his Super-Flyweight title against Mexican banger, Gerson Guerrero. The under card bouts feature many proven veterans and up-and-coming prospects. One such prospect is Cestus Management’s welterweight destroyer the undefeated Mexican American Raymond Gatica (11-0-0 w/6 kos) who will face off with Filipino southpaw Mark Jason Melligen, in an eight round bout. This fight promises to be an exciting affair as Gatica promises to showcase his skills and take care of business. Ray "LINO" Gatica had this to say about his opponent, "There is no way that Melligen will beat me, this is the opportunity that i have been waiting for and Melligen will not be able to handle what i will produce on February 13th and i promise that whatever Melligen does i will do better and win the fight with ease". Gatica continued, "I have trained hard and understand what i must do and i will give Melligan what he is used to and that's another loss". Gina Iacovou, Cestus’ CEO, said, “We are very excited and confident that Ray "LINO" (Gatica) will be victorious and is ready to step-up and begin to make a name for himself. Raymond has been working very hard in the gym and is looking fantastic". Iacovou continued, "Raymond is a very determined young man and the type of pressure and power that Ray "LINO” will produce will shock opponent". Mike Michael, who is Cestus’ Chief Advisor, said, “Ray Lino Gatica is ready to make his move in the boxing world and we will do whatever it takes to get him into the next levels. He (Gatica) is a very strong kid and a has tremendous natural talent and physical attributes”. Michael continued, "Melligen is a very predictable fighter who has never been in the ring with a fighter as strong and fearless and as gifted as Ray "LINO" Gatica. So lock the doors and run for cover this fight will be explosive!! ".